Paros. It sounds a bit like paradise, doesn’t it? Well, that’s what I think anyhow. And, although the translation itself means nothing of the sort, it’s how I would describe this Greek island. Paradise. It was bliss! The perfect balance of vibrant streets and relaxing beaches. We immediately fell in love as we wandered along the sea side, the scent of fresh seafood in the air. Locals called out to us as they invited us to eat in their restaurants. Although spoilt for choice, our decision was made easier as we spotted the perfect place to dine. We sat down at the rustic wooden tables found right on the water’s edge. The sound of soft Greek music played in the background as we marvelled at the deep orange sky. See? Paradise. 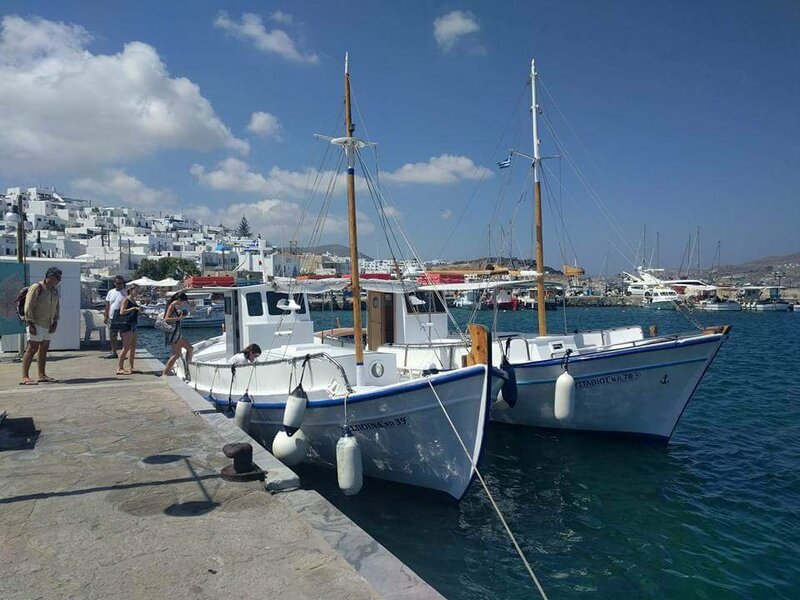 We could have easily spent every day in the old town of Parikia, lazing on the beach and indulging in the Greek cuisine, but we had heard of another nearby town that had us intrigued…Noussa, a small town on the North coast of Paros, which was known for its port and beautiful beaches. Noussa had us lost inside its thin cobbled streets, lined with white walls. Every single building pristine white juxtaposed with bright blue windows and doors. 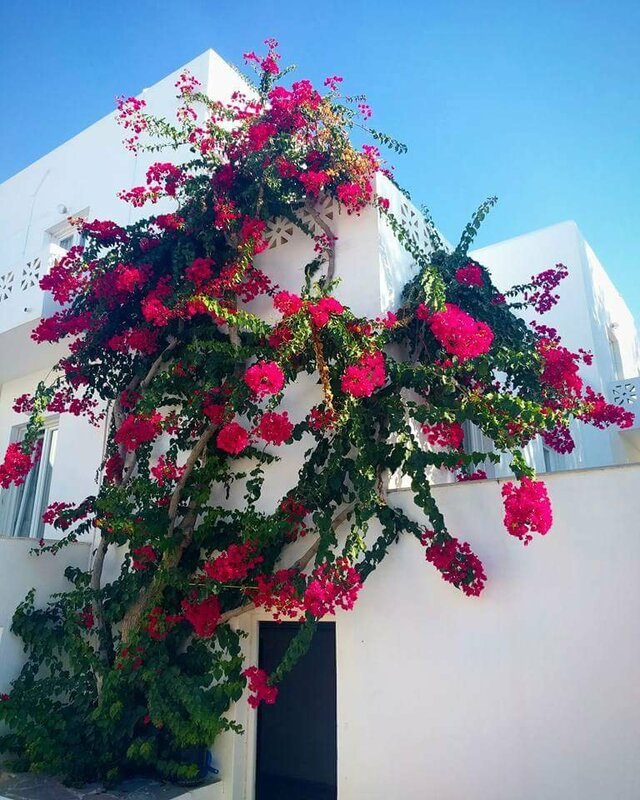 And then, the finishing touch – around every corner, a splash of perfectly pink flowers crawling up the wall; it was exactly how I’d pictured Greece. We eventually made our way out of the maze to find ourselves standing at the port. Fishermen perched in their small, rusting boats as they crafted new fishing nets and washed their catch from the day. As we waited for our boat, I admired the fresh octopus laying out on display. Oh, how I love the sea side! Our small (and incredibly slow) boat gently rocked side to side as it took us across the bay to the popular beach of Kolymbithre. A wonderful display of golden rocks jutted into the clear, blue waters. 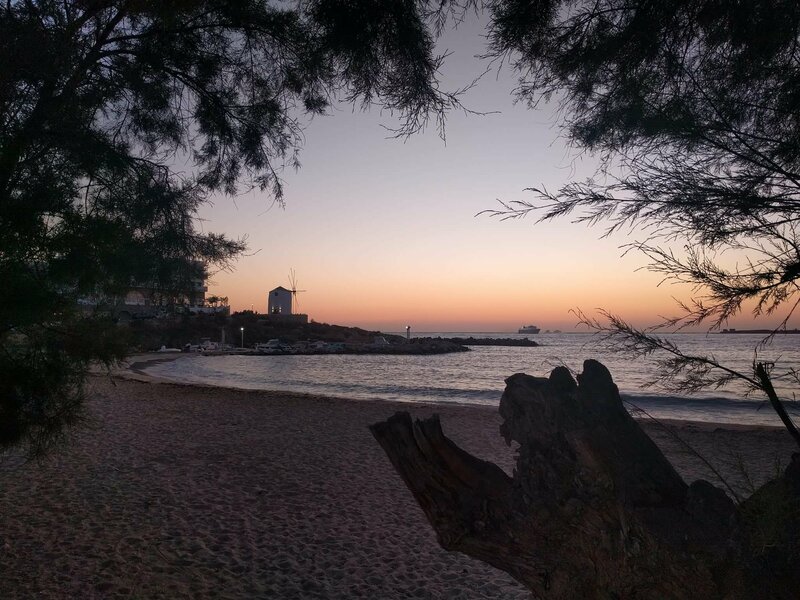 It was postcard-perfect and my favourite beach of Paros. After days of laying on the beach, we decided a stretch of the legs was in order. We ventured on what was meant to be a cliff-top sunset walk but, with only very basic directions, we found ourselves lost. After taking three wrong turns in the first hour, we decided to let go of the map and venture where we so desired. We continued to power up and up a hill. 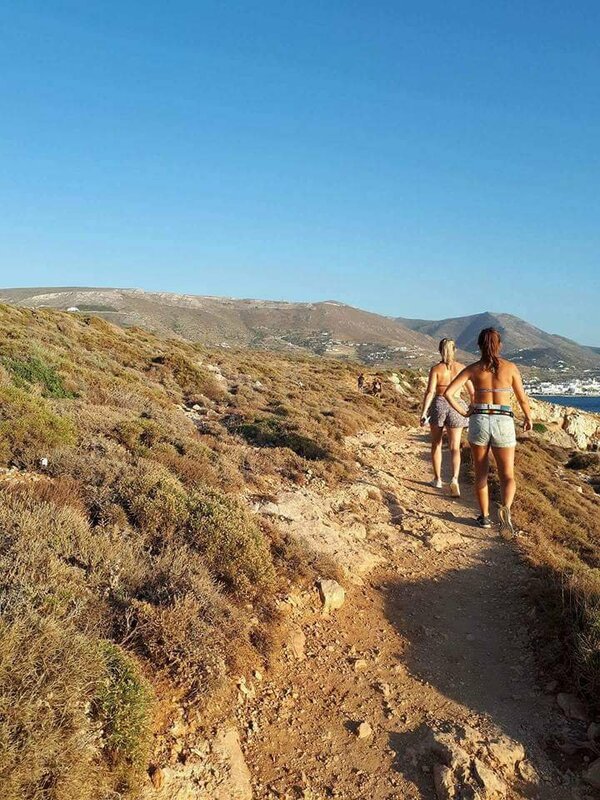 The breathlessness and sweaty brows were worth it for the incredible hill-top views of Parikia bay. Suddenly, a little panic arose as we started to realise just how far we had walked from the nearest water source. We joked about cutting into the cactus plants on the side of the road to sap their moisture. It was at that point that we realised we should attempt to venture back down the mountain. After (accidentally) trespassing on private property and deliriously singing a collection of Disney songs, we finally made it back to Parikia – just in time to plonk ourselves on the water’s edge and take in the sunset. Oh, how I will miss this place!